Last evening I wanted to make Cathie a homecoming dinner. It called for comfort food, and that it was. This Meat Loaf recipe, was posted way back on July 11th. Here it is again, its inspiration from a 1999 Cook’s Illustrated classic “The Best Recipes”. 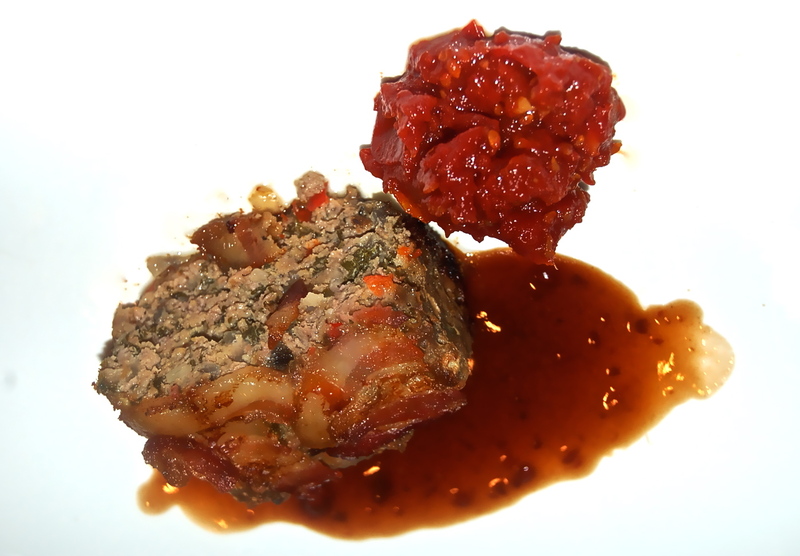 Within its pages was this well tested recipe for Bacon Wrapped Meatloaf. It has been my benchmark recipe ever since. And it’s never failed me. It felt good to be in front of the stove once again. 1. Heat oven to 350 degrees. Heat the EVOO in a medium skillet. Add Onion & Garlic; sauté until softened, about 5 minutes. Set aside to cool while preparing remaining ingredients. 2. Mix the Eggs with Thyme, Salt, Pepper, Mustard, Worcestershire Sauce, Pepper Sauce, & Milk or Yogurt. Add the Egg mixture to the meat in a large bowl along with the crushed Crackers, Parsley, & cooked Onion & Garlic. Mix until evenly blended & it does not stick to the bowl. (If mixture does stick, add additional Milk or Yogurt). 3. Turn the mixture onto work surface. With wet hands, pat mixture into approximately 9-by-5-inch loaf shape. Place on foil-lined (for easy cleanup) shallow baking pan. Arrange Bacon slices, crosswise, over loaf, overlapping slightly & tucking Bacon tip ends down the side of the loaf. 4. Bake until the Bacon is crisp & the Loaf’s internal temperature registers 160 degrees, about 1 hour. Cool for at least 20 minutes to allow the mixture to resettle. Note: A marvelous sauce and stock company in Ohio, “More Than Gourmet”, offers a Red Wine Reduction in a six pack, 8 oz each. Check them out on the web. A first class product line and a major timesaver. Thanks for your note about our products! We’re happy to be in your pantry. Jen, For many years I have been a devoted fan to your Sauces and Glaces. They are essential to my kitchen. My compliments to your splendid staff of sauciers.